This versatile crocheted starfish is a quick project that's perfect for using up scrap yarn. This pattern is simple enough for beginners while more experienced crocheters can whip up several of them in an evening. 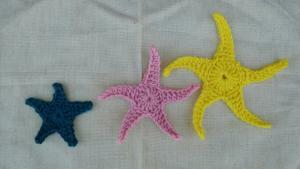 This free pattern makes a medium-sized starfish, about 5 1/2 inches across. Adjust the hook size according to how tight or loose you crochet. There will be a small hole in the center of the ring once all the double crochets are done. If you would rather it be closed, pull the tail of the start of the ring. To download and print this pattern in Adobe, click the image below. Click to download the pattern. Adjusting this pattern to make a smaller or larger starfish is simple. The smaller starfish measures about 3 1/2 inches while the larger starfish measures about 8 inches across. To change the size of the starfish, make your adjustment in the beginning chain of the arms. Ch 6, sc in the third chain from the hook, hdc in the next stitch, dc in the next two stitches, skip two stitches in the ring and sl st into the third stitch of the ring. Repeat four times to make the arms of the starfish and finish off. 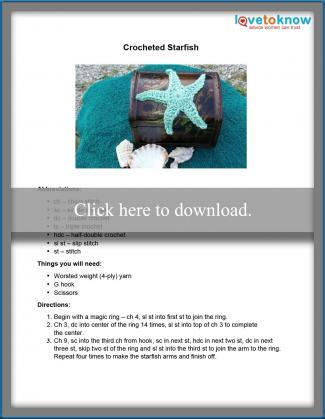 To make the large starfish, adjustments begin with adding stitches to the magic ring. Stitches are also added to the arms to make them longer and wider. To form the magic ring, ch 5 and sl st into the first ring. Ch 3, dc into the ring 19 times, sl st into the top of the ch 3. Ch 12, sc in the third chain from the hook, sc in the next two stitches, hdc in the next three stitches, dc in the next two stitches, tc in the next two stitches. Skip three stitches of the ring, sl st into the fourth stitch to attach the arm. Repeat four times and finish off. There are many ways to use your completed starfish. You can use them as appliques for blankets or clothing, or take two of the same size, sew them together and stuff them for ornaments or small toys. 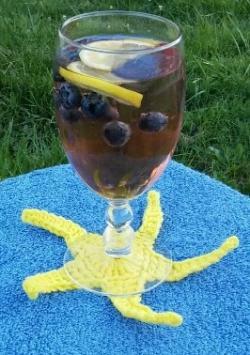 Alternatively, you can try one of these starfish-inspired ideas. If you have a beach themed bathroom, stitch up some towels to match. This hand towel is decorated with a medium sized starfish and two small ones. They can be all the same color or different shades that work together with the colors in the room. While the starfish can be hand sewn onto the towel, the easiest way to attach them is to glue them on with a washable permanent fabric glue, such as Fabri Tac. Fabri Tac can be found at most craft and fabric stores for less than $10. 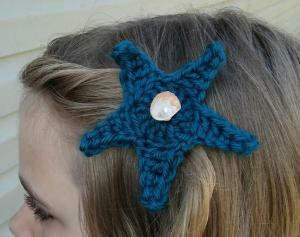 The small starfish can decorate many things including a little girl's hair. A pretty addition to a seashell-print outfit or a cute sundress, this barrette gives a touch of mermaid style. Use Fabri Tac adhesive to glue a small barrette to the back of the starfish. You can leave it plain or add a small seashell with a little pearl bead as an accent. 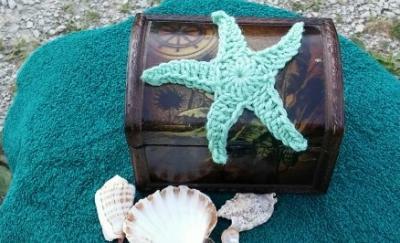 The large starfish are the perfect size for fun coasters for a beach themed party. If something is spilled, cleaning them is easy too. Throw them in the wash with your dish towels or bath towels. Bleach is not recommended for acrylic yarn though most stain removers can be used. If in doubt, test a scrap piece of the same yarn to make sure that the color won't be affected in the wash.
Crochet is a craft that takes practice. Tutorials make it easy to see and learn the stitches, and a project like this one lets you practice while creating something fun. 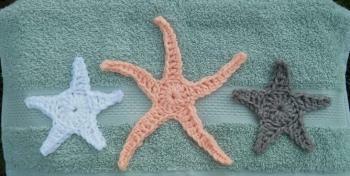 These starfish are a great project for beginners to try because they use basic stitches. If you end up making too many starfish, throw a beach party!